Summary: Researchers have discovered connections withing the brain that appear to form a communication pathway between areas that control decision making, movement and emotion. They believe cells within the network could also be potential targets for Parkinson’s disease. Researchers suspect cells in this brain circuit could also be targets of Parkinson’s disease. MIT neuroscientists have discovered connections deep within the brain that appear to form a communication pathway between areas that control emotion, decision-making, and movement. The researchers suspect that these connections, which they call striosome-dendron bouquets, may be involved in controlling how the brain makes decisions that are influenced by emotion or anxiety. This circuit may also be one of the targets of the neural degeneration seen in Parkinson’s disease, says Ann Graybiel, an Institute Professor at MIT, member of the McGovern Institute for Brain Research, and the senior author of the study. Graybiel and her colleagues were able to find these connections using a technique developed at MIT known as expansion microscopy, which enables scientists to expand brain tissue before imaging it. This produces much higher-resolution images than would otherwise be possible with conventional microscopes. That technique was developed in the lab of Edward Boyden, an associate professor of biological engineering and brain and cognitive sciences at the MIT Media Lab, who is also an author of this study. Jill Crittenden, a research scientist at the McGovern Institute, is the lead author of the paper, which appears in the Proceedings of the National Academy of Sciences the week of Sept. 19. In this study, the researchers focused on a small region of the brain known as the striatum, which is part of the basal ganglia — a cluster of brain centers associated with habit formation, control of voluntary movement, emotion, and addiction. Malfunctions of the basal ganglia have been associated with Parkinson’s and Huntington’s diseases, as well as autism, obsessive-compulsive disorder, and Tourette’s syndrome. Much of the striatum is uncharted territory, but Graybiel’s lab has previously identified clusters of cells there known as striosomes. She also found that these clusters receive very specific input from parts of the brain’s prefrontal cortex involved in processing emotions, and showed that this communication pathway is necessary for making decisions that require an anxiety-provoking cost-benefit analysis, such as choosing whether to take a job that pays more but forces a move away from family and friends. Her studies also suggested that striosomes relay information to cells within a region called the substantia nigra, one of the brain’s main dopamine-producing centers. Dopamine has many functions in the brain, including roles in initiating movement and regulating mood. To figure out how these regions might be communicating, Graybiel, Crittenden, and their colleagues used expansion microscopy to image the striosomes and discovered extensive connections between those clusters of cells and dopamine-producing cells of the substantia nigra. The dopamine-producing cells send down many tiny extensions known as dendrites that become entwined with axons that come up to meet them from the striosomes, forming a bouquet-like structure. 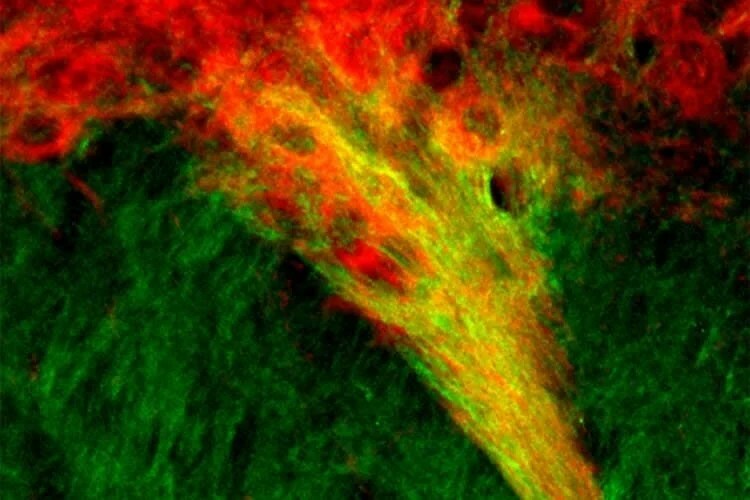 MIT neuroscientists have identified tight connections between dopamine-producing cells of the substantia nigra (red) and neurons in the striatum (green). These connections, which show up as yellow, may play a role in the brain’s decision-making processes. NeuroscienceNews.com image is credited to the researchers. This finding expands the known decision-making circuit so that it encompasses the prefrontal cortex, striosomes, and a subset of dopamine-producing cells. Together, the striosomes may be acting as a gatekeeper that absorbs sensory and emotional information coming from the cortex and integrates it to produce a decision on how to react, which is initiated by the dopamine-producing cells, the researchers say. To explore that possibility, the researchers plan to study mice in which they can selectively activate or shut down the striosome-dendron bouquet as the mice are prompted to make decisions requiring a cost-benefit analysis. The researchers also plan to investigate whether these connections are disrupted in mouse models of Parkinson’s disease. MRI studies and postmortem analysis of brains of Parkinson’s patients have shown that death of dopamine cells in the substantia nigra is strongly correlated with the disease, but more work is needed to determine if this subset overlaps with the dopamine cells that form the striosome-dendron bouquets. MIT “Newly Discovered Neural Connections May Be Linked to Emotional Decision Making.” NeuroscienceNews. NeuroscienceNews, 20 September 2016. MIT “Newly Discovered Neural Connections May Be Linked to Emotional Decision Making.” http://neurosciencenews.com/emotional-decision-making-neural-network-5079/ (accessed September 20, 2016). The dopamine systems of the brain powerfully influence movement and motivation. We demonstrate that striatonigral fibers originating in striosomes form highly unusual bouquet-like arborizations that target bundles of ventrally extending dopamine-containing dendrites and clusters of their parent nigral cell bodies. Retrograde tracing showed that these clustered cell bodies in turn project to the striatum as part of the classic nigrostriatal pathway. Thus, these striosome–dendron formations, here termed “striosome–dendron bouquets,” likely represent subsystems with the nigro–striato–nigral loop that are affected in human disorders including Parkinson’s disease. Within the bouquets, expansion microscopy resolved many individual striosomal fibers tightly intertwined with the dopamine-containing dendrites and also with afferents labeled by glutamatergic, GABAergic, and cholinergic markers and markers for astrocytic cells and fibers and connexin 43 puncta. We suggest that the striosome–dendron bouquets form specialized integrative units within the dopamine-containing nigral system. Given evidence that striosomes receive input from cortical regions related to the control of mood and motivation and that they link functionally to reinforcement and decision-making, the striosome–dendron bouquets could be critical to dopamine-related function in health and disease.